Early Christianity appealed to people of varying occupations and social status. While many early Christians were poor, even slaves, others were not; Christianity had a particular appeal to wealthy women, in whose homes churches sometimes met. In between persecutions some Christians even served in governmental positions. The early church worried about some occupations, however; those in immoral trades (like prostitution) or connected with pagan religious practices had to give up their jobs before baptism. Ignatius of Antioch (c. 35–107) tells how Christ called him to suffering and death. 64–late 200s: Persecution of early Christians occurs under various emperors. Tertullian (c. 160–225) explains the ways in which following Christ is difficult. Martyrdom of Perpetua (third century) describes Perpetua parting from her family for the sake of her faith. Apostolic Tradition (third or fourth century) specifies occupations Christians need to give up. 300s: Christianity becomes the Roman Empire’s official religion; monasticism begins. Gregory of Nyssa (c. 330–395) writes about his sister Macrina’s humble life. Augustine (354–430) rejects his former occupation and relationships after his conversion. 400–500s: Roman Empire crumbles; monasticism grows. Benedict (c. 480–550) outlines both spiritual and practical aspects of living in community. After the Roman Empire fell apart, the leadership of the church continued to be largely drawn from the Roman aristocracy, even as military power became concentrated in the hands of Germanic rulers. Monasticism, originally a reaction against Christianity’s increasing respectability, grew and blossomed—and became respectable itself—all over Europe. “Vocation” largely meant a calling to become a priest or a “religious” (monk or nun), and there was great concern about how Christian rulers should conduct themselves. In the age of “Christendom,” believers were found in all places and social classes. Starting around 1300 Europe began to transition to a more city-based economy with a rise in trade, culture, and what would eventually be called the “middle class.” At the same time, numbers of laypeople began to take their calling to serve God in their professions with a new seriousness. Gregory I (540–604, pope 590–604) describes how pastors ought to exercise their vocation. By the 1100s: Monasticism dominates Western Europe. Thomas Aquinas (1225–1274) relates the active and contemplative aspects of Christian calling. Dante Alighieri (1235–1361) describes a journey through the afterlife that is also much concerned with this life. William Langland (c. 1332–1386) describes a world excited and disturbed by economic growth. Thomas à Kempis (c. 1380–1471) stresses hope and trust in God. Martin Luther famously pronounced all honorable work a calling from God and began a tradition of Protestants reflecting on how to serve God in nonchurch employment and how best to choose an occupation. Christians continued to labor in occupations at all levels of society, with varying levels of agreement on how much social mobility was possible between those levels—and whether success in “worldly” occupations represents spiritual success as well. 1500s: Reformation and Counter-Reformation transform the religious landscape. Martin Luther (1483–1516) argues that “calling” applies to all people, not just religious professionals. Martin Bucer (1491–1551) encourages people to enter professions that will profit their neighbors. John Calvin (1509–1564) emphasizes the role of believers as stewards of God’s goodness. George Herbert (1593–1633) writes on how to labor faithfully, even through discouragement. Brother Lawrence (c. 1611–1691) finds God’s love in everyday tasks. Richard Baxter (1615–1691) urges Christians to gain worldly wisdom but use it for eternal purposes. John Flavel (c. 1630–1691) notes the spiritual significance of earthly labors. Late 1600s–1700s: The Enlightenment leads people to question the influence of Christianity. 1700s–early 1800s: Industrial Revolution transforms the vocational landscape. John Wesley (1703–1791) encourages his followers to live disciplined spiritual and social lives. The Industrial Revolution moved the site of many people’s labor from country to city and from home to factory. Christians wrestled with how to deal with the poverty, crime, and unrest that often resulted­—in the face of a social order that frequently seemed hostile to Christianity. They also wondered whether meaningful work was still possible in an increasingly mechanized and computerized society. A “faith at work” movement emerged in which both clergy and laity struggled with how to equip church members to find meaning in their work. 1800s: Modern “Catholic social teaching” and the Protestant “Social Gospel” emerge. Pope Leo XIII (pope 1878–1903) calls for employers to respect laborers and laborers to respect themselves. 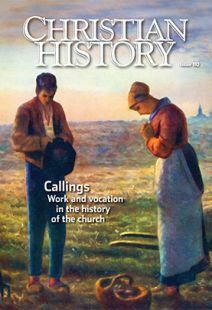 c. 1900: First wave of the “faith at work” movement begins. Walter Rauschenbusch (1861–1918) urges churches not to monopolize the “best and the brightest” as clergy. Dorothy L. Sayers (1893–1957) urges excellence in everyday work. 1940–60s: Second wave of the “faith at work” movement begins. Sam Shoemaker (1893–1963) takes the church to the world. Dorothy Day (1897–1980) calls for lives of radical hospitality. Thomas Merton (1915–1968) writes about seeking God in darkness and doubt. Gaudium et spes (1965) and other Vatican II documents discuss the dignity of all people’s callings.